Looking for a tool which allows creating quizzes? PC Shareware Inc. has designed the software Create A Quiz for that purpose. Teachers, parents or even students can use it. Creation: To create a quiz, the software will ask the user to fill the compartments containing the possible answers and questions. He then directly ticks the exact solution from the main interface. Customizing: The questions are not only limited to texts. 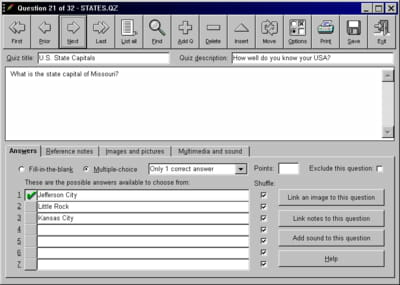 Create A Quiz also has several options offering the user the possibility to insert images, arrows or any geometrical symbol. He just has to click on them. Setting: The program also enables the user to define the answering time between each question via the parameters. Dozens of rules can also be set such as the timing of each round or establishing scores for a challenge. Print: Create A Quiz also offers the user the possibility to print his creation when needed. It enables him to choose whether to display the solutions during the process or not. Create A Quiz is not complicated to use. Multiple choice questions, surveys and other exercises can be created with this tool. Latest update on August 28, 2015 at 10:04 AM.